It is amazing what we can learn about mice. They love cheese and are loved by cats. 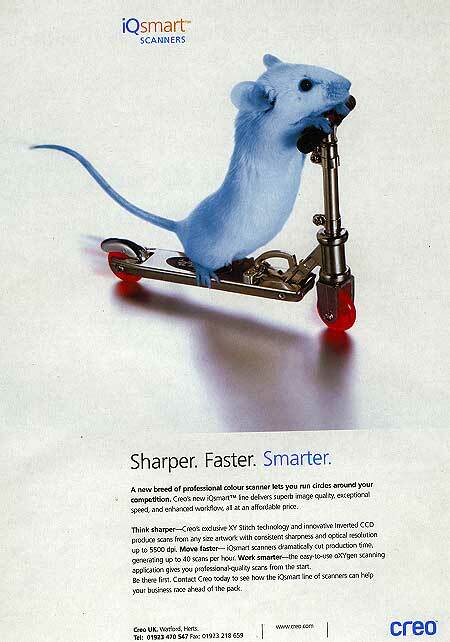 Mice are small, yet strong or smart. They don't make any noise, are used for test purposes and gave their name to a computer device. Mice are extremely versatile. A bottle of beer, a printer, a bank account, a scanner, a spread-sheet, human resource management, you name it, most likely has something in common with a mouse. Sometimes, not very often, our neighbour's cat brings home a mouse. The kill is always grey. 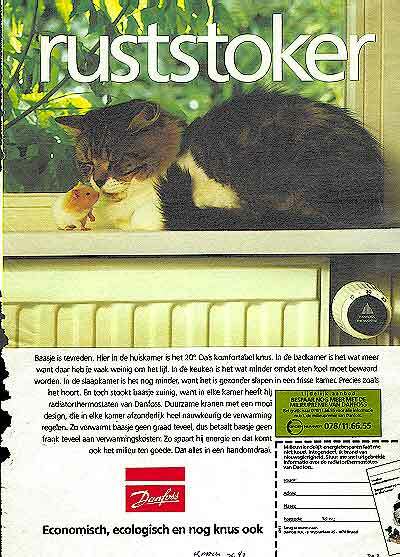 Mice in adverts are almost without exception white. Somewhere a bias is at work : or the cat prefers grey prey, or the advertising people fall for white. It's probably the latter. 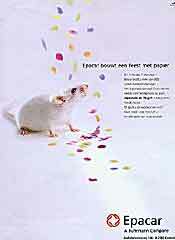 White laboratory mice are much more easily to come by. One of the more popular approaches is to work with contrast. We've seen it with the Elephant where the enormous power is squeezed into minute objects. The same technique is applied at the other end of the scale. Mice are very able sellers-by-contrast. 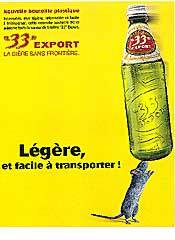 Even a mouse can carry the 50 cl plastic bottle with beer (the idea !) 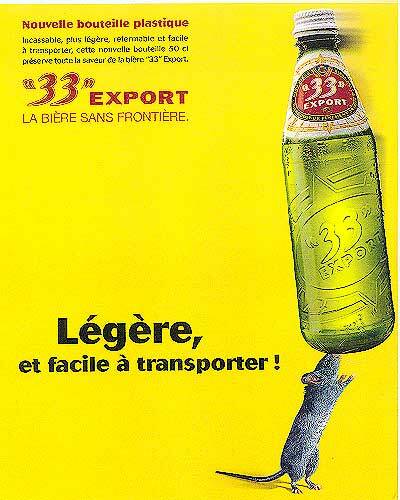 of ad (1) : Lightweight and easy to transport - preserves the flavour . 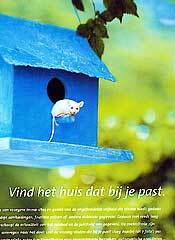 Unbelievable what an ordinary mouse can do with our new software , yells ad (2). 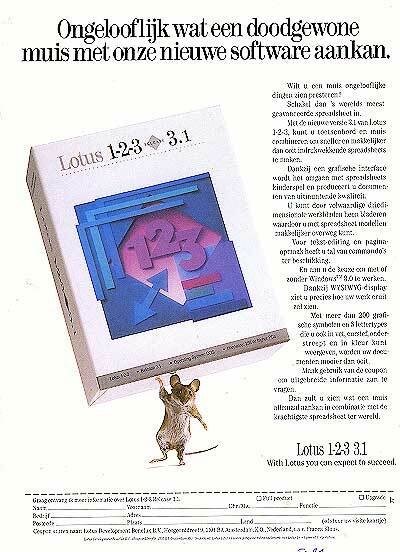 The mouse bears the huge box (contrast) and the text (we are in 1991, the age of the 33 MHz PC) elaborates on how you can combine keyboard and mouse to work better. 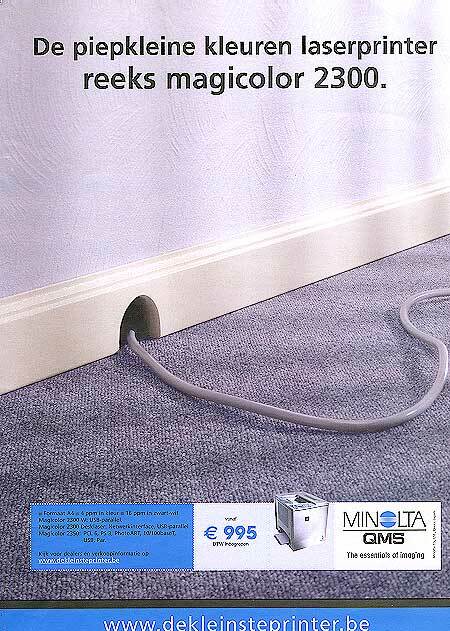 A clever combination of two mouse-ideas. The contrast of big against small is obvious in our third ad. The performance of this printer is elephant and you'll have it all for a price that is mouse. 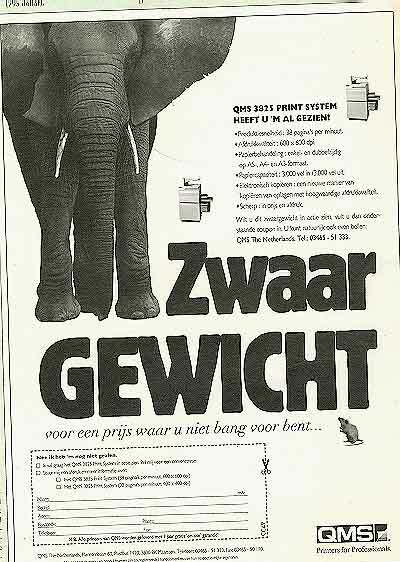 Text ( Heavy weight for a price that doesn't scare you ... ) and image are based on the mouse scares elephant joke theme. 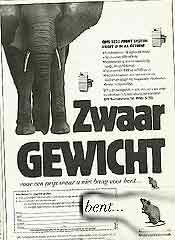 Both ads also show a feature often present in Dutch adverts : the English closing-shot. 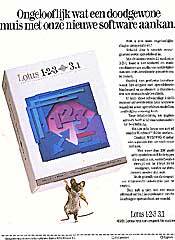 It's meant to impress the reader: With L. you can expect to succeed (2), Printers for professionals (3), The essentials of imaging (8). Ad 4 is straightforward How silent is your printer? but advert 5 is stacked with ideas. Mouse is the name of a computer device forcing you to keep at least a small part of your desk paperless. 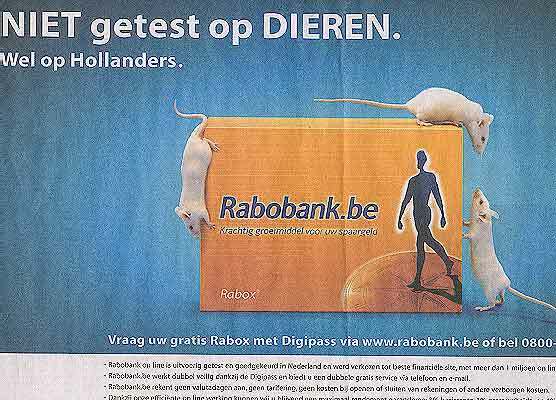 The advert is about banking from your computer: internet banking, hence the mice. Laboratory mice. They are the link to the bold statement Not tested on animals giving way to the smaller print but on Dutchmen . 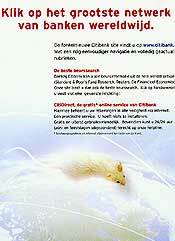 The message comes from a Dutch banking company and is directed to the Belgian reader. The Belgians know for sure that the Dutchmen are skinflints. 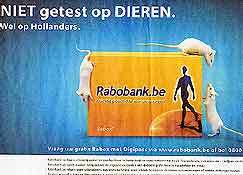 If the Dutch people consider the proceeds good enough, why wouldn't the Belgians (known as blockheads) try it as well? 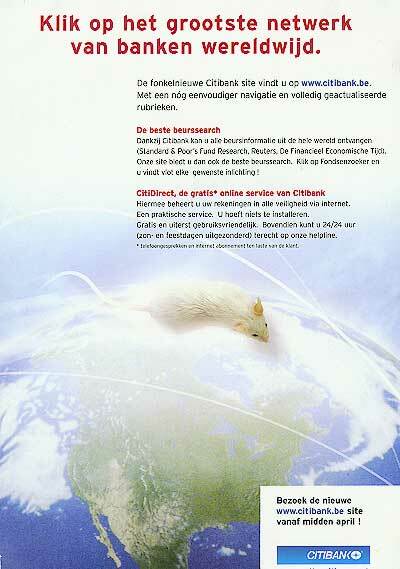 Two more examples of the mouse = computer = internet line of thinking are shown in ad (6) and (7). 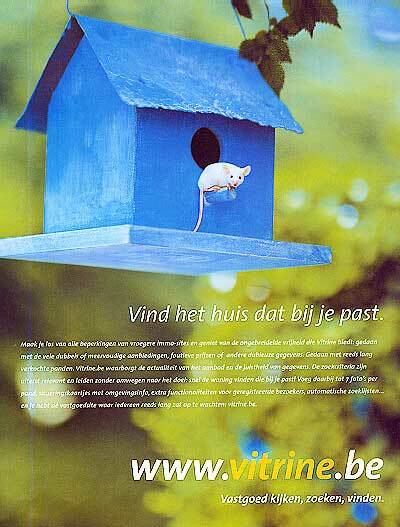 The first (from 2001) announces an internet site selling real estate: Find a home that really fits you . That's not going to work without a mouse. Very predictable and a bit easy-going a white mouse was chosen. But look carefully. The nesting-box hangs on wires meant to prevent access from visitors without wings. And yet, there is a mouse at the doorstep. Could it be done by purpose? To stress the superior matching results of the site? Congratulations. 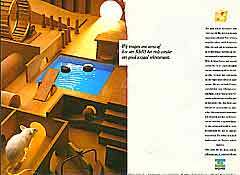 A virtual mouse in ad 8. It's the same brand as in ad 3. In 1995 it was about the price. Now it's the size of the printer being small. Although the message is obvious, it's unclear how small exactly the printer is. 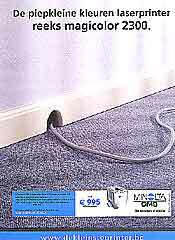 The cable disappears into the wall. Must we read the cable as the tail of the mouse? 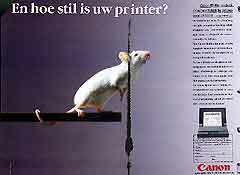 Then mouse = printer meaning that the printer is as small as a mouse. Or is the cable simply the cable meaning that a mouse took the printer away? 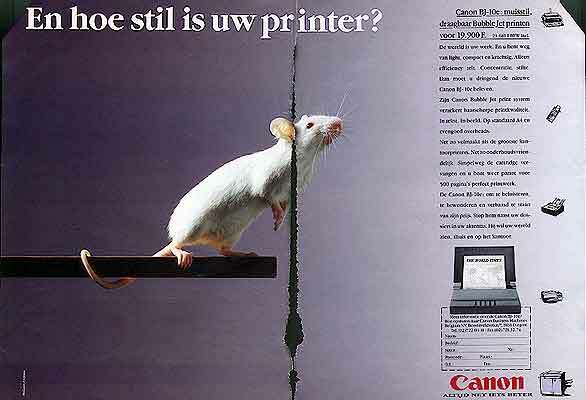 Then obviously the printer must be smaller than a mouse, or at least manageable by that rodent. Central heating creates a cosy atmosphere. No doubt about that after advert 11. The image is much stronger than the creaky text. 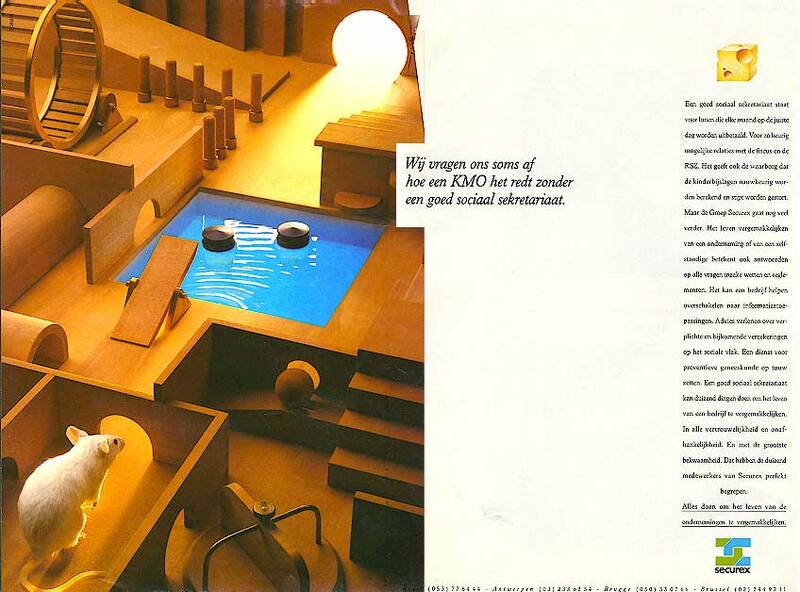 The most important element of this ad is the maze. The maze stands for the complex legislation and the mouse is you, trying to make sense of it. 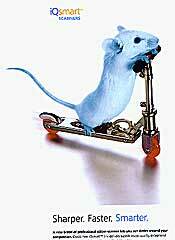 It's always risky and the choice of a laboratory mouse is very apt. Notice the cheese in the corner top right. It'll become yours if you let the advertiser help you out. Interesting usage, because mouse with cheese is more often used to signal Good image quality. Read more about that in [Illustration 5] - True Colour. (12) 1991 - How can you manage without us?